“When the student is ready the teacher will appear,” goes the faked quote wrongly attributed to Buddha. Having just misused the quote to say something backhandedly prideful about myself - a poet-wannabe proud to be sitting in the presence of a master - I’m sure I blushed. Cid wasn’t interested in my embarrassment, though. “Everybody has the truth in them. Why be afraid to admit it? Trust your own words and be your own truth,” he said with a smile. “Anyway, here, read this …” and then he passed me a letter he’d received that day from a writer as famous as Cid was. As I marveled at even holding such a thing in my hand, Cid talked about his relationship with this person in a way that made me feel that I was an equal, a person of value, and a close friend. Cid was a circle and he brought me inside. This was back in 2003, a fairly lonely time in my life, and what would turn out to be the last year of Cid Corman’s life. 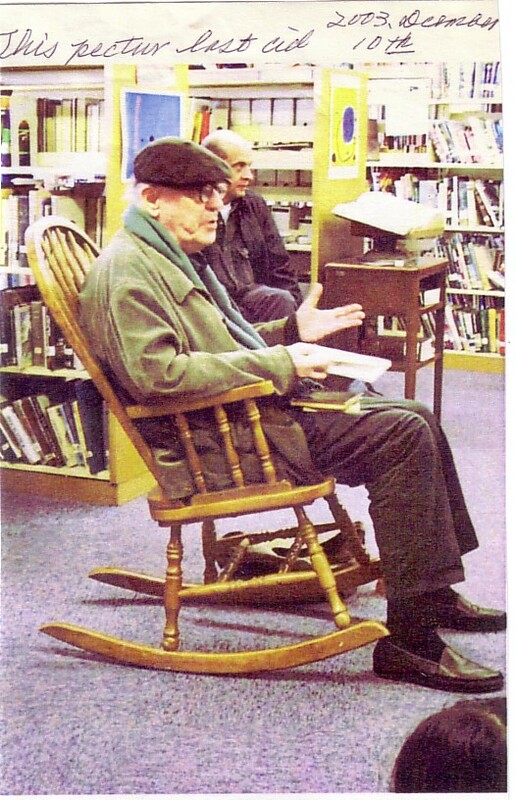 As a student of American poetry in university, I’d read and greatly admired Cid’s work in anthologies and was the proud owner of a few issues of Origin, a seminal poetry journal he’d edited which introduced the world to many of the major American poets of the late 20th century. Now, there I was sitting in his living room in Kyoto, Japan and though not at all ready to learn what Cid began teaching me that day, entirely welcomed just as I was, right from the start. “Here, look at this,” Cid said. How I came to know Cid is a long story about how the connections one has early in life and don’t think too much about turn out to be the most important connections of all, but that’s not what I want to tell you about now. What I want to tell you about is how I’d take a series of trains and buses every Wednesday that year to meet with Cid, how this great man would be waiting for me at the bus stop near his house, how he’d greet me not as if I was a student who had come to learn, but as the most important person in his life at that moment. During the hours we’d spend together each week, Cid gave me the gift of his complete and undivided attention. He also gave me a thousand stories, some new ways of seeing, a handful of tools I needed right then to live more fully, a vision for how to build a community while living out on the edge of the world, and a model for being a teacher that I’ve tried in my own way to follow ever since. “You don’t need to be in a classroom to teach, you know. You don’t have to be in a school to learn,” Cid told me. “A teacher doesn’t draw lines,” he said. “A teacher is the line and that line has to form a circle,” he told me. “Pull everyone into that circle you are. That’s what teachers do. That’s what we’re doing here,” he said. His words came back to me today as I thought about this post and the influence Cid Corman has had on me. Maybe I’m ready now? Yes, I am ready, and yet still learning from this teacher who years later keeps appearing in my thoughts and my life. These are my words. This is my truth. I have it in me. I’m not afraid to admit it. Thank you for seeing that, Cid, even when I didn’t really believe it was in even me. "Pull everyone into that circle..."
"This is my truth. ... I’m not afraid to admit it." There is some equivocation here that seems to wriggle out of confronting the real difficulty, is there not? Pulling everyone into the circle only makes sense if there is one truth for everyone. Teachers who want to pull the children into the circle of truth, work on the assumption that there is such a truth. But if the truth is only your truth, why believe it is right to pull others into your circle? If there is something to be anxious about admitting, it is not a personal truth, but one that is supposed to hold for others too. And who has the courage in our post-imperial and post-industrial and post-everything age to stick his neck out and pronounce that there is such a truth? Thanks so much for your comment Torn Halves, and forgive me for not seeing it earlier. The only truth I refer to in my post is this: we all matter and everyone has value, no matter who we are. This is not a difficult reality to grasp. 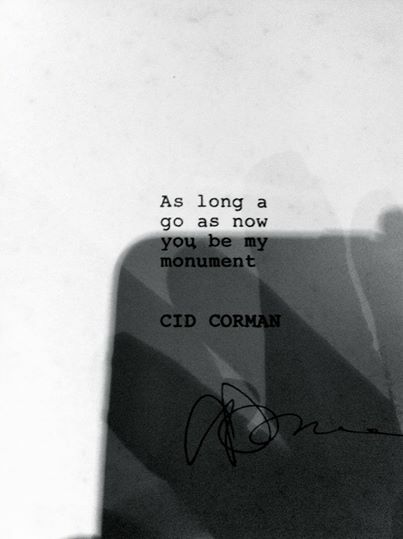 Though a very famous and learned man who could have easily struck me down, instead Cid Corman offered me his gentle humanity and pulled me into what I call "the circle" as an equal and gave me the opportunity to learn with him. Having come from an academic background where hierarchy matters and having had my share of teachers who did draw a line between themselves and their students, I found Cid's approach revolutionary. There was no dogma involved. There was a teacher and there was a student learning together as equals. This is the circle. Twenty years before that moment I write about, Cid had left academia because he could not longer work within that structure. Ten years later I would follow for the same reasons. Today I work with a lot of very famous people. I also work with a lot of people who are not famous at all. I treat them all the same. They are all the same. This is the truth. Anyone who wants to come inside the circle and learn with me and the people I work with is welcome. It doesn't matter who you are. If you ask, I'll say yes. Then we'll work to find out what we can learn with and from each other. This is the circle. It's nothing complicated or dogmatic, and i have the courage to admit it.